Piazza accommodates rambunctious preschoolers, crawling infants, and toddlers decorating cookies all at once! 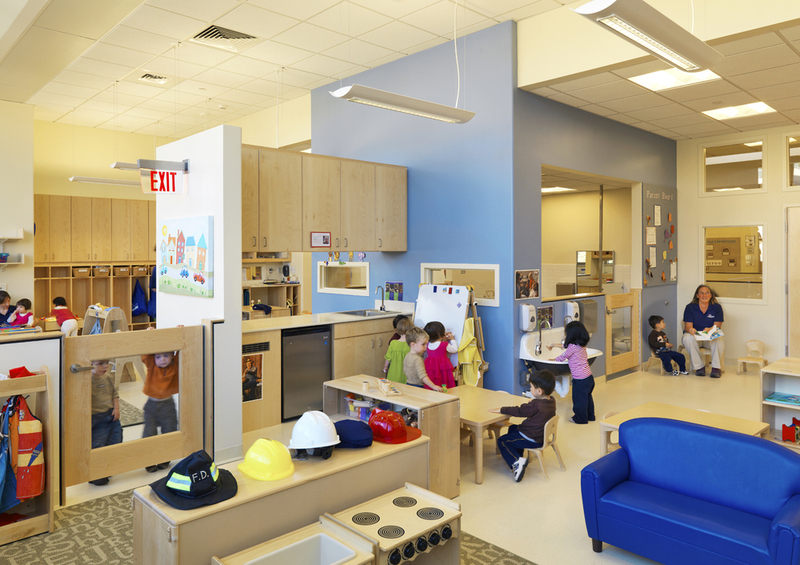 50 square feet per child in each classroom! 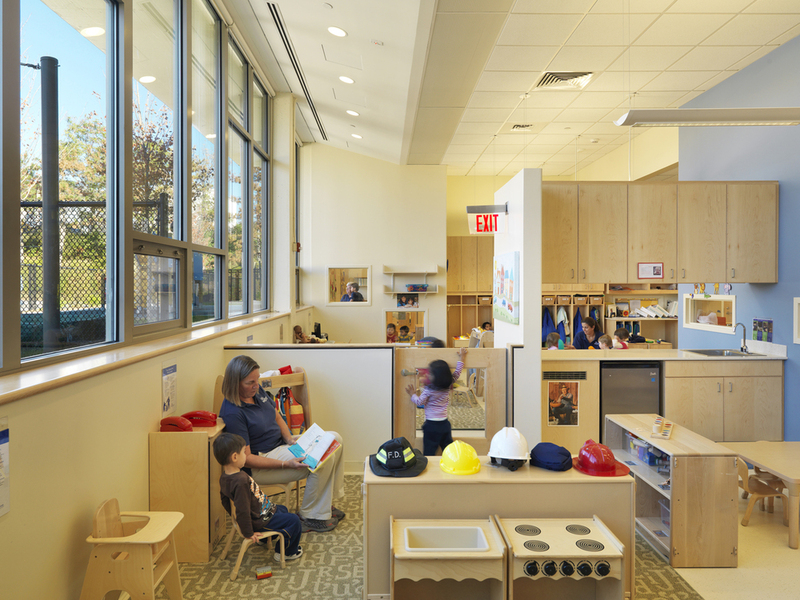 The University of Massachusetts Medical School and Memorial Hospital wished to create a new, high quality childcare center utilizing the campus’ existing facility inventory. Locating the new center in a sublevel, bunker-like space with just a single exterior wall to accommodate windows made for a multi-faceted challenge. D. W. Arthur Associates was a leader of an integrated project delivery team. Working in collaboration with a dedicated contractor resulted in a project that was efficient, cost effective, and uncompromising in its design values. Every space has direct or borrowed light and exterior views, making this previously dreary basement a light filled “loft” with engaging common areas and well-scaled classrooms. The existing space, with a sub-grade floor level, single exterior wall, and atypically high ceilings, presented both design challenges and opportunities. 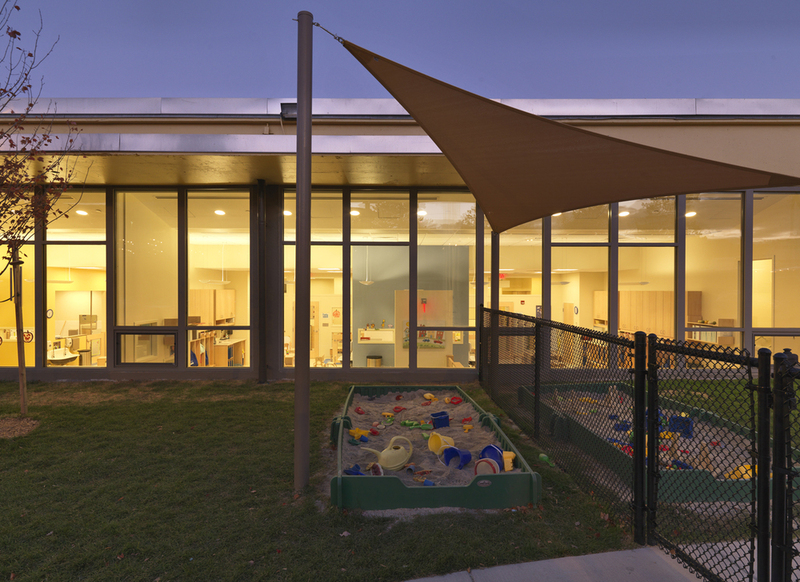 Entering at grade level, a wide, gently sloped ramp spirals down toward the reception area. On the outer edge of the ramp, a series of individually lit display alcoves for children’s artwork create a processional gallery. The inner edge of the ramp encircles and defines an open parent resource area with benches and bookshelves “carved” out of the ramp. 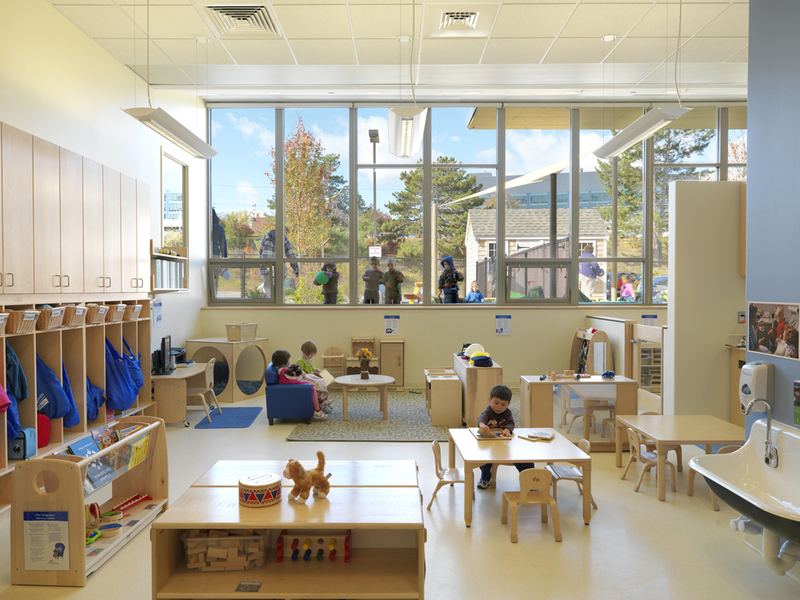 These spaces not only help to display the work of the school but provide a transition space unto itself for the children and parents separating and reuniting at drop-off and pick-up times. The biggest challenge to transforming the existing space was to alter its bunker-like quality. The single exterior wall which had been windowless was opened up and filled in with glass. The programmatic elements were arranged so that every classroom has a view to the exterior. Classrooms are connected through interior windows. Select interior partitions do not extend all the way to the ceiling, creating a sense of openness and allowing light to flow through all spaces. All the classrooms and staff rooms open on to the central commons or piazza area that is well lit from above through three large light scoops penetrating through the existing concrete waffle slab roof. The staff rooms, quietly situated at the back of the space, are designed with interior windows that allow views through to the commons and the classrooms, and are also well lit by the skylights. The piazza is used for gross motor activities by the children. 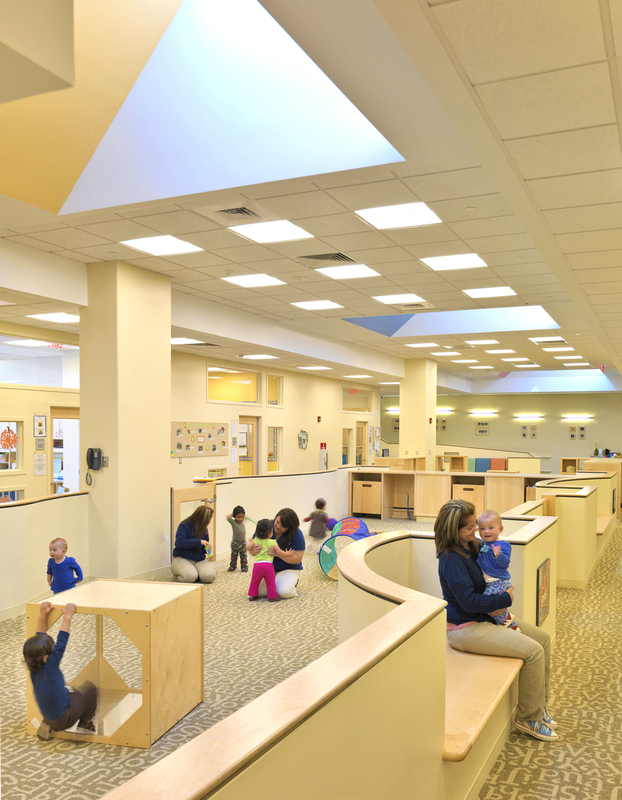 Circulation to the classrooms is separated from the play area with gates and low height walls. On one end of the piazza is an open kitchen; its placement is like a café at the edge of a town square. A child-height counter sets off the adult space yet allows the kitchen to be used for teaching or demonstrations. 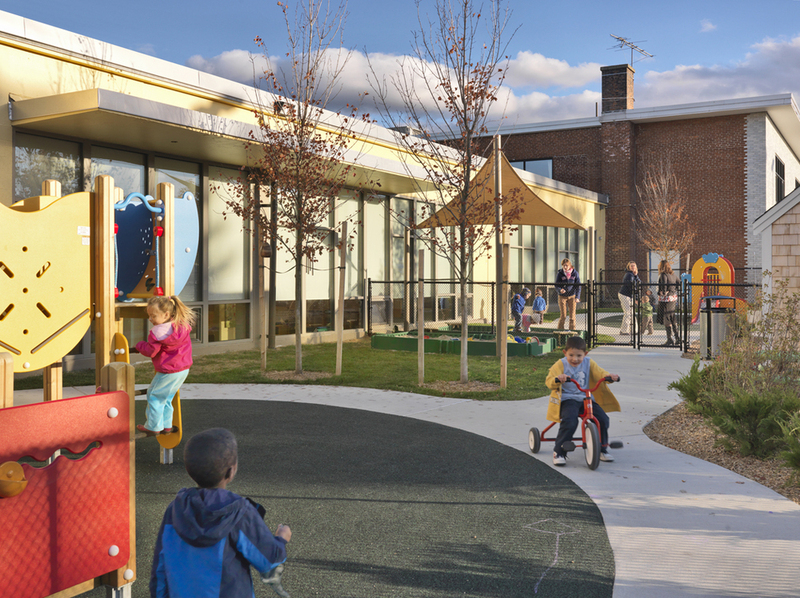 A small storage divider allows the piazza to be used simultaneously by both crawling infants and cavorting preschoolers. The continuous activation of this central space throughout the day fosters a sense of community for all of those connected to the center.